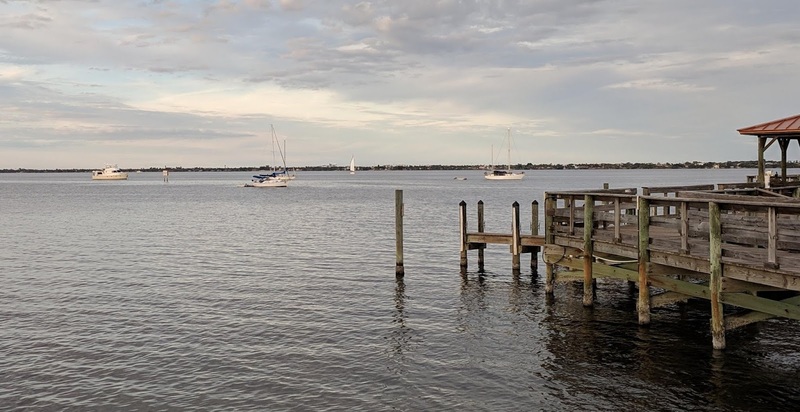 We are under way southbound in the Indian River, part of the ICW, after a nice three-night stop in Eau Gallie, FL (which is really part of Melbourne). The stop there was occasioned by dinner engagements with three sets of friends. After last I posted here we had a calm overnight passage. I did not see a single other vessel on my watch, even though we were only a few miles offshore. We were close enough to have Internet coverage the entire passage. 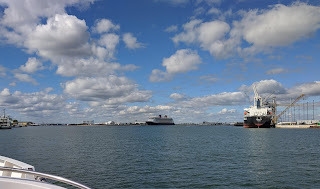 Arriving at Port Canaveral. Disney Dream is center frame. When I came back on watch around 8:30 am we were offshore of the massive Kennedy spaceflight complex on Cape Canaveral. No rockets were on the pads, and the northeast door of the enormous Vehicle Assembly Building was, uncharacteristically, open. No rocket was behind that door, either, so perhaps they were just equalizing temperatures. The building is tall enough that it forms its own weather inside. We were steaming into Port Canaveral a little before noon. 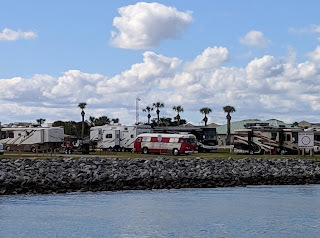 As we approached Jetty Park to port, a well-used campground, we spotted a Flxible Starliner bus conversion, and I could not resist sending a photo to our good friends Ben and Karen, who have been living in their nicely converted Starliner, the Creative Cruiser, for a while now. You can see their conversion on this page. 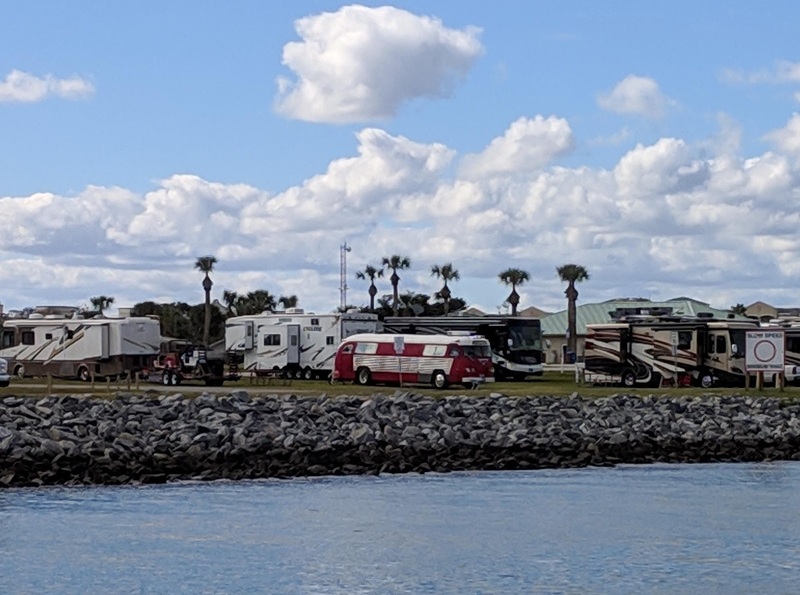 Flxible Skyliner in the overflow area of Jetty Park. The destination sign read "Margaritaville." 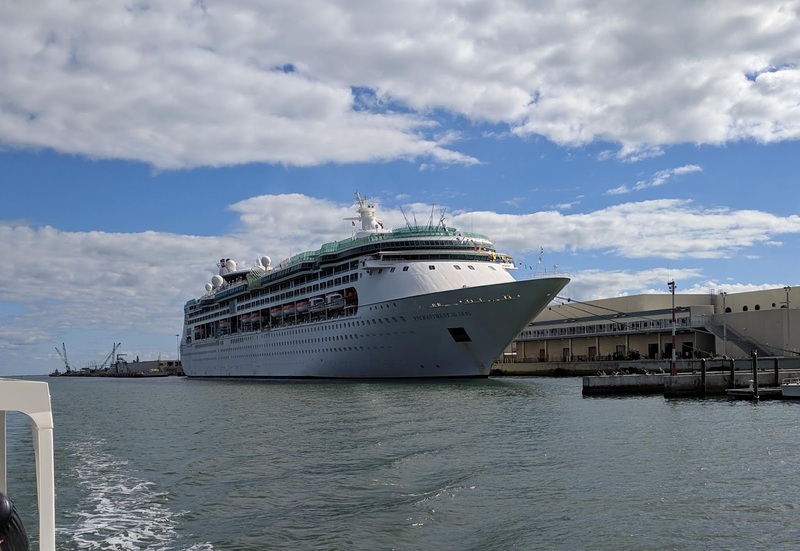 We also left Royal Caribbean's Enchantment of the Seas to port, as well as the small collection of waterfront restaurants and tiki bars that are the dining and entertainment hub of Port Canaveral. 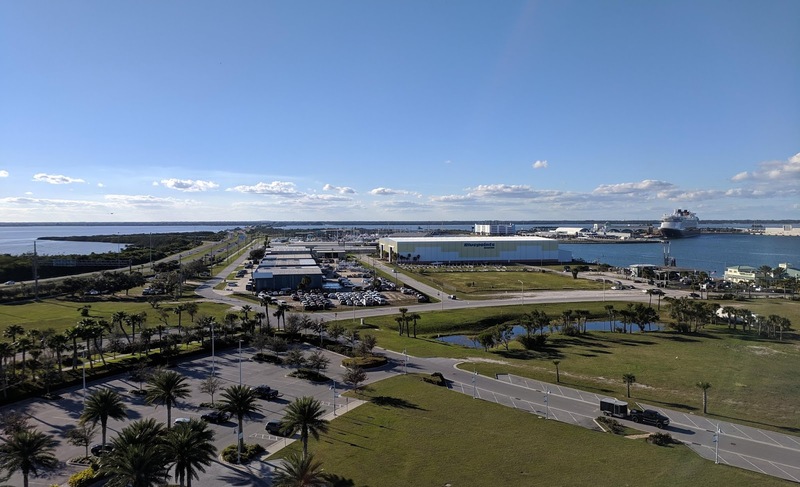 We arrived at the west end of the harbor, across from the main cruise basin and the Disney Dream, to find the free quay at Rodney Ketcham Park available and mercifully devoid of fishermen. On our last stay I caught some unfortunate lady's line as I was spinning around to dock. We were tied alongside by 12:30 (map), using the last four remaining cleats, large and rusting, leftover from the quay's previous life as a commercial berth. I spent part of the afternoon walking around the south side of the harbor, stopping in at the swoopy Exploration Tower, which houses an interactive museum as well as an observation deck. From the top, the port looks like it could be part of the wide Banana River, which literally surrounds the port on three sides, but the two bodies of water are separated by a lock and the river is very shallow. Looking west from Exploration Tower. Vector's flybridge is barely visible center frame. From here the water all looks the same, but it's not. I briefly considered dropping a scooter so I could ride down to Cocoa Beach and look in on our friend Dave-the-hotelier, and then maybe scoot over to Fiesta Mexican Restaurant, a long-time favorite of ours (and former astronaut hang-out). A quick Internet search, however, revealed that he sold his hotel last year. This was our top-secret Cocoa Beach parking spot when we stopped in Odyssey, just steps from the beach and right next door to the Ron Jon surf shop. Dave installed a 50-amp power outlet and water and sewer connections for his RV friends. Louise was not up to walking nearly a mile to dinner, and we didn't want to drop a scooter just for that, so we had a nice dinner aboard. In the evening we strolled up to the head of the lock and back. We had a quiet night in the port, dropping lines in the morning for the run west to the ICW. On my walk I passed "Jade II" from Brazil, on the hard in one of the local yards. We met these folks and toured the boat at a Trawler Fest years ago. Their web site is gone and the boat appears to be for sale. We cleared through the bridge and the lock and crossed the Banana River to find some sort of skulling event blocking the Barge Canal just west of the river. Fearing I would have to thread my way through the skulls, we slowed down and tried hailing their support boats on several radio channels. Finally I had to resort to the Kahlenbergs. Tootle them melodiously. They started their westbound race just before we arrived, and the sad reality is that a well-rowed skull is faster than Vector at cruise. They stopped and re-started several times before turning off the canal, but we never caught back up to them. Having slowed down for them initially put us just a couple of minutes behind for the 401 bridge mid-canal. As we arrived, just ahead of 11am, the tender tried to tell us we were too late for an 11am opening and we'd have to wait to 11:30. This despite the fact that we could easily make an opening started on-time at 11. Even when you are right there already waiting, the published time is when they actually start lowering the traffic gates. Passing Enchantment of the Seas on our way into Port Canaveral. Their sail-away party when they departed was so loud I could hear it from the Exploration Tower. After a bit of back and forth she agreed to open the bridge. It turned out that there were maintenance workers who needed to clear out of the way, and so she was late getting it open anyway, and we actually had to slow down rather than rush to make it. Imperious bridge tenders are the bane of Florida boaters. We had a bit of nervousness approaching the exit of the Barge Canal into the Indian River and the junction of the ICW. Numerous notes on-line in Active Captain and Waterway Guide informed us that the channel has been shoaling, and at least one skipper with a six foot draft said he was unable to get through. Moreover, the "sonar chart" function of our Navionics chart program on the iPad said there was just 4.5' of water mid-channel in the worst section. 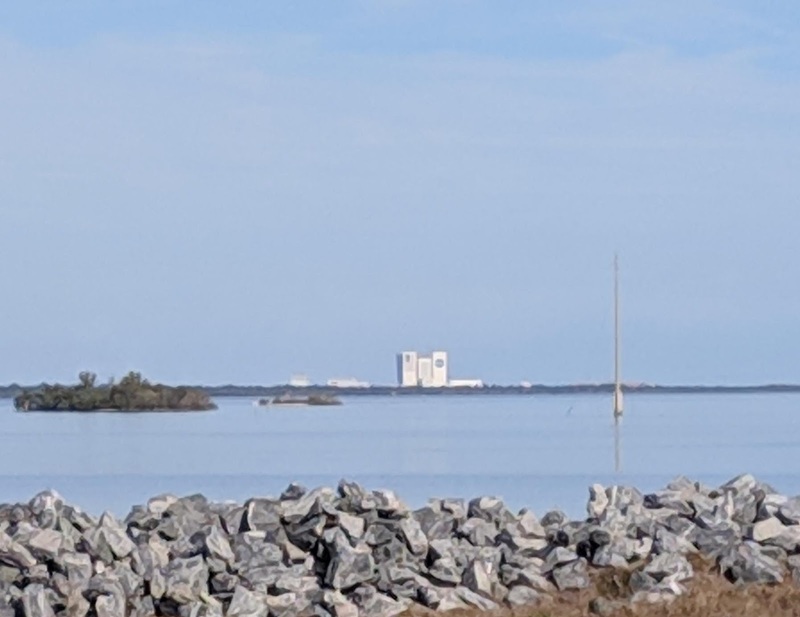 This one's for Harvey: I snapped this photo of the VAB, some dozen miles away, while we were in Canaveral Lock. There was a time when all that information would have given us enough pause that we would not even attempt this. The alternative being to remain at Port Canaveral and wait for another outside window. 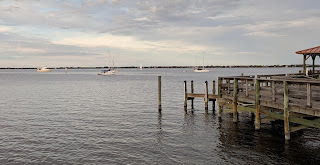 Experience is a great teacher, though, and we know now that, while there is no tide at all in this part of the Indian River, the water level varies with the wind. Steady winds out of the north for several days will drive a lot of water out of the river, which is constrained to the north by the tiny Haulover Canal. We were guessing, or maybe that's "hoping," that both the comments and the crowd-sourced sonar chart data were derived during a sustained period of northerly wind. We were just through here a year ago with no issues. Sure enough, the least depth we saw on the sounder was 7.3', which by itself would have been alarming if we were not armed ahead of time with the shoaling reports. We putt-putted through at an idle speed of 4.5 knots just in case, prepared to stop, back out, and about-face at any point. The 7+ foot depths we blissfully short-lived, and we made it out of the canal uneventfully without so much as kissing the bottom. Once in the Indian River we were able to set the autopilot and have a very relaxing cruise the rest of the way to Eau Gallie. En route we had a visit from a very curious dophin, who swam alongside us for several minutes. Normally the dolphins who swim with us like to run up front, playing in our bow wave. This one instead chose to pace us amidships off the port side. Periodically he'd curl his whole body to point his snout at us, a behavior we'd not seen heretofore. We arrived at the Eau Gallie causeway by 2pm, and dropped the hook north of the causeway just offshore of the library (map). Our last visit we had anchored south of the causeway and tendered in to the basin, but there's no public dinghy dock there and little to walk to. Though less protected here, we could get ashore at the public dock next to the library, and the waterfront restaurant Squid Lips also has a courtesy dock. Our friends Pauline and Rod from Australia picked us up at the city dock, and after cocktails at the home of the friends with whom they are staying, we went out to a nice dinner at nearby Chef Mario's restaurant in a historic bank building near the causeway. We met them on the water years ago in their trawler, Two by Two, and more recently they also traveled the US in a Marathon Prevost bus conversion. They have since sold both and are continuing their travels by auto and hotel. It was great to catch up. Wednesday I spent some time ashore strolling around town. In addition to Mario's and Squid Lips there are perhaps three other restaurants an easy walk from the dock, including a new brew pub. There is also a nicely stocked Ace hardware, a post office, an art museum, a funky little arts district with several shops, and the aforementioned library which has free WiFi and several nice seating areas. We met friends Gayle and Bill from the sailing cat Spiraserpula for cocktails and dinner at Squid Lips. We last saw them in Oriental, NC, a few months ago, and it was nice to catch up again. They have family in the area and keep a car here, so they spend their maintenance downtime at nearby Waterline Marina in the basin. 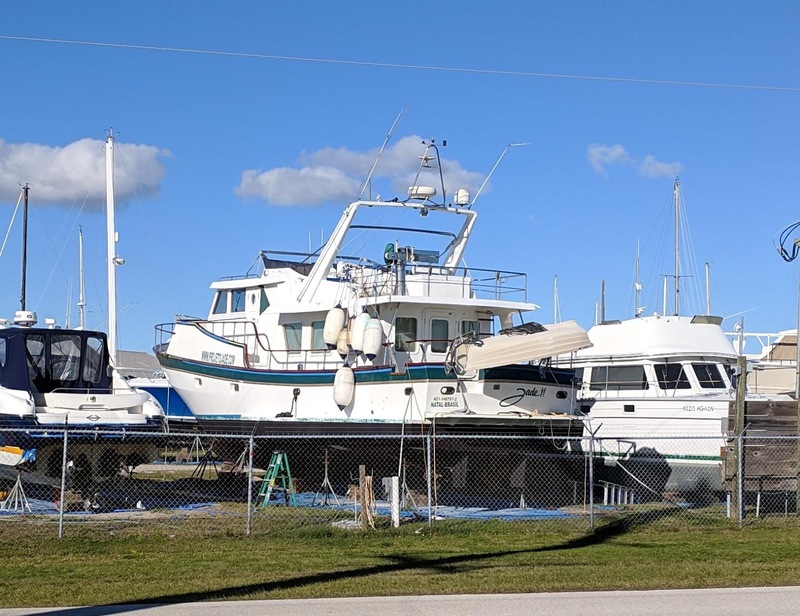 They're in the process of closing on some waterfront property with a dock in Punta Gorda, which will be their maintenance base moving forward. We look forward to visiting them there. Vector anchored in Eau Gallie. City dock/fishing pier is at right. Yesterday I again wanted to get off the boat, but it was cold and choppy and, aside from that, I got a morning email from our insurance agent, and needed to spend the whole day working on moving our business elsewhere. They dropped our previous underwriter, and the only replacement coverage they could find for us was literally double the cost and had too many restrictions. Quotes have already started rolling in so I am hopeful we will have this resolved before our current policy expires later this month. Around 4:30 we braved the steep chop to head back to Squid Lips for a farewell pitcher of beer with Rod and Pauline before we were joined by good friends Cherie and Chris, known to many of our followers as Technomadia. They're currently docked in Sanford at the head of the St. Johns, which is a good 90-minute drive, but we all really wanted to catch up, and Cherie has family in Melbourne, making the trip double-duty. It was great catching up and discussing cruising plans as well as the vagaries of boat maintenance; they are in the middle of re-installing overhauled turbochargers, among other work. This morning we decked the tender and weighed anchor to continue south. Tonight we should be in Vero Beach, and we've arranged a quick meet-up with long-time friends Alyse and Chris. They are working the Stuart Boat show for the weekend, the very place where we met them exactly nine years ago. They'll have just a few minutes before they have to get home to let their dogs out. This will make four couples visited in four nights, which might be a record for us. Update: We are anchored in Vero Beach, just south of the bridge (map). We'd bypassed this anchorage many times because the NOAA chart says it's two feet deep here, but in reality it's ten feet and we were able to navigate in using our Navionics Sonar Charts. In the morning we'll weigh anchor and continue south. Now that we are in striking distance I have made a reservation with the marina in Fort Lauderdale. With a little luck we should be there on Tuesday. 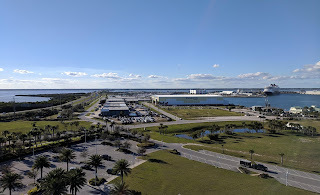 We were in TGO resort near Titusville last week, and traveled to Cocoa beach on the A1A a couple times probably right past where you were moored in Port Canaveral. Our Closest meeting yet I'd say. There was a small bus rally in the TGO resort, also while we were there and that red Flxible Starliner was there. I recognized it right away from your picture and the Margaritaville destination sign. Caron has just put up a new blog post and included some close up pics of this bus in it. I'd be happy to send you the 4 originals if you like also. I attended a 3 day photo course with Ben in the Smokey mountains in 2006? and have followed his long creative cruiser build. Nice to see them finally on the road. Happy New Year and happy sailing.